This is a picture of Blackness castle situated in the small hamlet of Blackness near Linlithgow, Scotland. 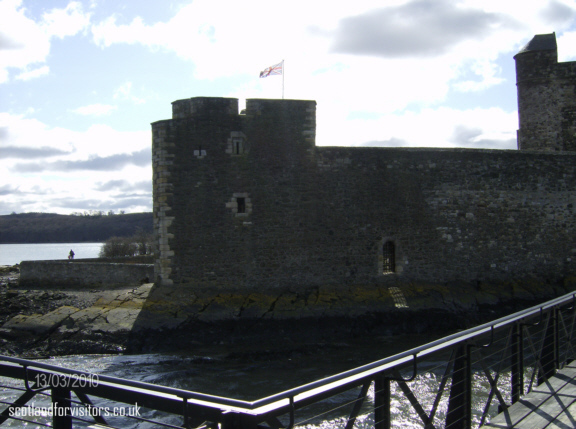 The photograph of Blackness Castle is taken from the end of the pier which was built to aid in the unloading of ammunition from ships sailing up the Firth of Forth, during its role as an ammunition depot. The picture clearly shows it proximity to the River Forth. Blackness Castle has served many purposes since it came into royal hands in 1453. For much of its history it has served as a prison in one shape or another. When the surrounding lands were annexed by King James II, many of the following years saw it used as a prison housing the more prestigious of the King's various enemies. Blackness Castle was once again used as a prison when it helped house the large number of French taken prisoner during the wars of the late eighteenth and early nineteenth centuries. But in 1870 its use changed when it became the army's central ammunition depot in Scotland. It was at this time that the buildings around the grassy courtyard to the south of the castle were built, together with the pier. 1912 the army left Blackness Castle, only to return during the first world war before departing for good in 1918.